Stencyl 2.1 is a pass over the Scene Designer to improve its usability and utility. The Inspector is a Properties pane for any object inside a scene. Objects include Actors, Tiles, Regions, and Joints. The Inventory is a comprehensive listing of all objects inside a scene. Combined with the added ability to define a custom name for an object, this makes it easier to manage your scene and keep track of what it contains. Not related to the Scene Designer but a little something we've found to be really useful and stuck in. You can import and export games from the Welcome Center (the game listing). Let you place objects outside of bounds. Some users were reporting sluggish performance on complex or large scenes, whether moving objects around or changing scene dimensions through insert/removing rows/columns. These performance issues have been addressed. - Improved Scene Designer performance when working with large scenes. - Improved performance when resizing large scenes. - Shortcuts to flip between tools using spacebar. - Shortcuts for all the main actions (like toggle grid, background). - More shortcuts to switch between tools and working modes. - Make it easier to work with tiny actors. - Make Snap to Grid a Toggle. - Fix mouse wheel zooming. - Fix pre-rotated actor angles. - Prevent guests from publishing games to the Arcade. - Prevent guests from publishing games to StencylForge. - Show sign in prompt on startup. - Fix bugs related to app not restarting if Java is not installed. - Fixes and enhancements to many pre-shipped behaviors. Must grab the installer for this! - Fix for the RPG sample game not running. - You should no longer need to save a game to see those changes during a test. Awesome, those are a bunch of great features!! I saw mention of making it easier to work with smaller actors. Does that also include increased precision for setting up collision on smaller objects? Glad that actors will be able to be placed out-of-region, that's been kinda weird to have to work around. 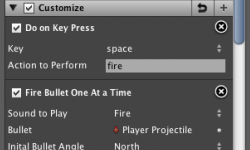 >> Does that also include increased precision for setting up collision on smaller objects? You can already zoom in on the smaller objects. Is there something else you'd like? I downloaded the nightly build, last night, and the inspector, inventory, etc, are already in there, but do not seem to be functioning. Sometimes, the inventory is blank white, even when there are tons of objects in the scene, and the Customize dropdown never has anything in it, so (as far as I can tell) I cannot customize the behaviors of an Actor instance in the scene. Is this expected, should I just roll back to a non-nightly? Well he did mention that it was only a mockup atm and will blog about the features when they are done. You should never overwrite nightlies over your most current stable release builds of Stencyl. Those are just first cut feature/code. We are aware of the problems. But feel free to give your feedback. Thanks. While you're on the topic of setting up collisions, could you add the ability to place collision shapes outside the bounds of the image's height and width for 2.1? Right now, if my actor's graphic is a 40x40 square, I can place a sensor to the right of that actor by manually entering an x-postion greater than 40, but I can't make a left sensor because x-positions cannot currently be a negative value. Also, it doesn't let you drag and drop collision shapes outside of the image bounds, even though the size of the graphic itself shouldn't necessarily determine the size and location of collision shapes and sensors. The nightlies are bleeding-edge development code. Stick with 2.0 stable. - Let you place objects outside of bounds. While you're on the topic of setting up collisions, could you add the ability to place collision shapes outside the bounds of the image's height and width for 2.1? Being able to duplicate collision bounds across multiple animations on one actor would also be good. They are not ready at this time - that's why I made no offer/mention to try out the nightly. I wouldn't characterize this as bleeding edge or beta - it's simply not done/implemented yet. The moment it's in a presentable shape, I'll let you know. Saving those pennies.. Gonna go Pro..